Recent manual and movement therapy blogs tout the importance of thoracic spine (t-spine) mobility as if it were a new discovery. But is it? Structural integration innovator Ida Rolf determined that her work could be enhanced by first freeing the rib cage, chest wall, and diaphragm. Similarly, another great educator, Philip Greenman, DO, dedicated two chapters in his textbook “Principles of Manual Medicine” to assessment and treatment of t-spine and rib cage mobility issues. So why is this suddenly a hot topic? Simply put: kinetic chain awareness. 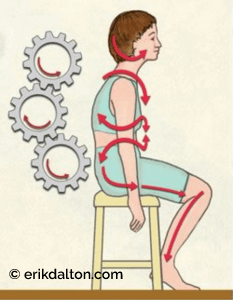 Therapists are rediscovering how lack of movement in one area negatively affects function in adjoining tissues, and how the neuromyoskeletal system distributes abnormal tensions via kinetic chains (Img. 1). Everything in the body is linked, says sports-movement guru Gray Cook: “You can’t remove a major link from the chain without seriously impeding performance.” Our joints, limbs, and muscles represent a collection of fascially bound structures designed to manipulate objects and propel us through three-dimensional space. Because all segments of the kinetic chain require differing degrees of mobility and stability, it is essential that we assess all major junctions independently. Image 2: Kyphotic t-spine leads to flattened lumbar lordosis, weakened diaphragm, and forward head posture. For instance, during gait evaluation, it’s easy to visualize how lack of ankle mobility may affect knee function, or how an adhesive hip capsule could cause pelvic bowl compensations that destabilize a sacroiliac joint or the low back. However, confusion often arises when one observes the t-spine and rib cage. Although the t-spine has twice the rotational capacity of the lumbar spine, it is sometimes hard to imagine this sturdy-looking structure being very flexible. Image 3: To create space between rib cage and pelvic girdle, the client’s right hand isometrically pulls on the table while the therapist mobilizes thoracolumbar fascia and intercostals. T-spine hypomobility has become so commonly accepted in our society that people rarely notice they have a problem. Nearly everyone slumps when sitting, and few perform the types of exercises that require a full range of spinal motion. Those who spend hours at computers sacrifice t-spine mobility for stability, as joint and ligament proprioceptors designed to inform the brain where it is in space become lazy. Conversation between body and brain grows difficult and unreliable. Eventually, coordination, balance, and movement become limited and painful. Image 4: To lift a kyphotic t-spine and activate an inhibited diaphragm, the client forcefully exhales as the therapist’s webbed hands work all tissues binding the diaphragm. To enhance the release, the client performs slow pelvic tilts. When you shoot a rubber band, it will be propelled a greater distance the farther back it is pulled. Similarly, the greater your myoskeletal mobility, the greater your range of motion, and the more tension (and therefore power) you’ll be able to generate. This particularly applies to competitive athletes. Strength without the ability to move freely is pointless. Any compound movement requiring precision and communication between connective tissue, joints, and the brain will be more difficult, and the risk of injury—or reinjury—that much higher. Power, output, and speed are all compromised by reduced joint mobility. 1. Kamkar A, Cardi-Laurent C, Whitney SL. Conservative management of superior subluxation of the first rib. J Sport Rehabil. 1992;1(4):300–316. 2. DeStefano L. Greenman’s Principles of Manual Medicine. Philadelphia, PA: Lippincott Williams & Wilkins; 2011.